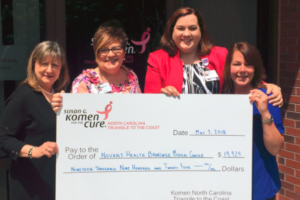 Susan G. Komen North Carolina Triangle to the Coast (Komen NCTC) announced that $350,000 in fundraised dollars will be distributed through the Community Health Grants Program and Komen’s National Treatment Assistance Program in 2018. 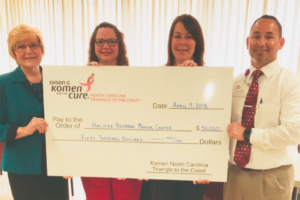 To help achieve Susan G. Komen’s bold goal to reduce current breast cancer deaths by 50 percent in the U.S. by 2026, Komen NCTC annually funds projects to help meet the most critical needs of the local community. Halifax Regional Medical Center: The Breast health project is designed to keep low income, uninsured or underinsured women residing in Halifax, Northampton and Warren Counties on the Breast Health continuum of care. 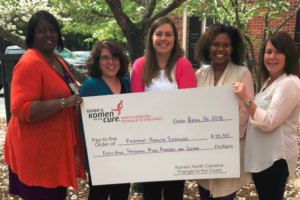 Komen funds assist our patients by paying all or part of the costs for the initial screening mammography, diagnostic mammography, breast ultrasounds, surgical consultations, breast biopsies, and radiation treatment. Initial qualifications are low-income women who are uninsured or insured with only one policy that has a deductible of at least $350. Patients can generally be qualified within 24-hours of making their initial application. If you are interested in applying for prior approval please contact Terry Mason or Bessie Poe at the Halifax Regional Mammography Center in Roanoke Rapids, NC at 252-535-3417. 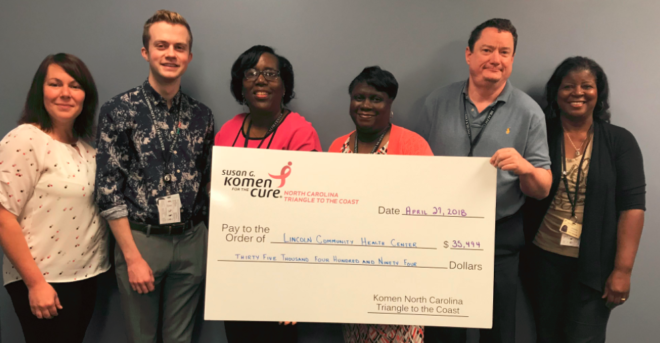 Lincoln Community Health Center: A primary care clinic serving patients in Durham and Granville Counties, offers Komen-funded breast cancer screening and diagnostic services. We provide Komen-funded screening mammograms and diagnostic mammograms, ultrasounds, and biopsies to women aged 40 and older who do not have adequate insurance to cover these services. Existing Lincoln patients should see their primary care provider for a routine exam if they would like to be screened for breast cancer, and if they have symptoms, they should schedule an urgent care appointment. Patients who have not been to Lincoln before should schedule a new patient visit and inform the provider that they would like to be screened for breast cancer. All appointments can be made by calling 919-956-4034. We offer these services at our main site in East Durham as well as several of our satellite clinics. Learn more about Lincoln, our locations, and our providers at www.lincolnchc.org. Questions about our Komen-funded services should be directed to Awanya Caesar, RN, BSN at 919-956-4029. 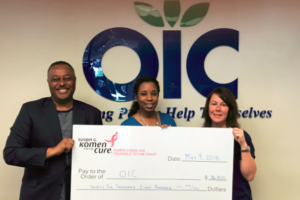 OIC Family Medical Center: The Program will use Komen grant funds to provide free case management, mammograms, and diagnostic services to underinsured women, aged 20 and over, who reside in Edgecombe and Nash Counties in NC. For more information on this program, please call either (252) 446-3333 or (252) 210-9856 and ask to speak to Patricia Neville, Care Coordination Manager. Piedmont Health Services: Project Access – Chatham County is a program that offers free access to screening mammography services with partner Rex Mobile Mammography at the Moncure and Siler City Community Health Centers. Our goal is to screen 340 uninsured patients on the Rex Mobile Mammography Van at both of these locations. Services are available to individuals who are registered patients of Piedmont Health Services, where Spanish-bilingual services are available to uninsured patients on a sliding fee scale. Please contact Jen Cunningham at cunningj@piedmonthealth.org or 919-913-1097 for more information. 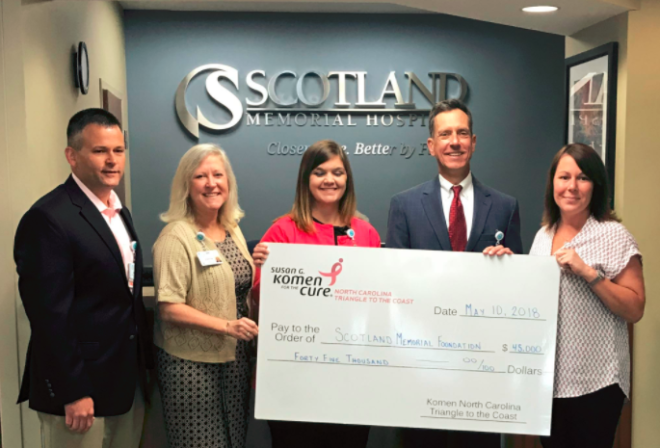 Scotland Memorial Foundation: Breast Health Outreach for Scotland County will utilize a Breast Health Navigator to guide Scotland County women ages 36-64 who are uninsured, underinsured or have financial concerns through the process of a mammogram and any possible follow-up tests. A physician referral is required for all mammograms and the Breast Health Navigator will be available to assist women without a primary care physician in finding a doctor for referral. To schedule a mammogram, contact your doctor. If you do not have a doctor, contact the Centralized Scheduling Department at Scotland Memorial Hospital at 910-291-7243. Vidant Edgecombe Hospital: The Breast Cancer Treatment and Survivorship Assistance Program helps breast cancer patients avoid delays in treatment by addressing gaps and barriers to care and recovery. The oncology patient navigator provides one-on-one services to cancer patients in a family-like setting and utilizes various community resources to reduce barriers to treatment and survivorship for breast cancer patients. 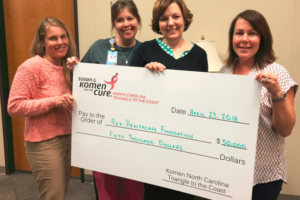 With funding from Komen NCTC, they will provide assistance to breast cancer patients from Edgecombe, Nash, Halifax, Wilson, Northampton, Pitt, and Martin Counties or any breast cancer patient receiving care at Vidant Edgecombe Hospital to reduce any delays in treatment and improve survivorship. Assistance is available to breast cancer patients who access the patient navigation program at Vidant Edgecombe Hospital and meet standard charity care guidelines. Treatment-related expenses include, but are not limited to: medications, co-pays, treatment-related bills, lymphedema treatment, chemotherapy drugs, and diagnostic (follow-up scanning). Assistance with transportation is also available. To find out more about the assistance program, call our oncology patient navigator, Scott Phillips, LCSW, at 252.641.8313.